If you fail to prepare, prepare to fail. But what if you haven’t got a place to prepare? That’s the dilemma for MK Dons as they approach one of the biggest games in the club’s history. “Last week, we didn’t have somewhere to train until half an hour before training until a school got us out of the mire,” said manager Karl Robinson. Woughton on the Green has been home to Dons ‘training facilities’ since they moved to Milton Keynes in 2003. Initially a temporary measure, very little has changed in the 12 years since. Frankly, public playing fields aren’t a place suitable for a Championship football club. They weren’t really suitable for a League 1 side either, but needs must when the devil drives. 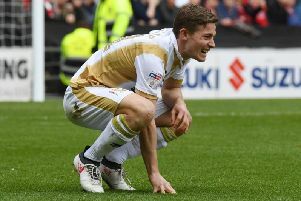 But seemingly stifled at every turn when it has come to finding place to build a training base in Milton Keynes, Dons have been unable to develop their base for even simple water drainage. The recent rainfall, far from causing the same devastating scenes as in Carlisle, has prevented Dons from training on grass for more than two consecutive days in over two months. And just two days before their vital clash with Bolton, Dons faced an extraordinary scenario: they were a Championship club without a place to train. “Last week was embarrassing,” said chairman Pete Winkelman. “We signed a top player from the Premier League in Jonny Williams. He’s excited about playing here, but it comes to training and we can’t train at Woughton because it has been raining. “We couldn’t train in our dome because the disability teams are in there, and it’s as much for the community as it is for us. At the 11th hour, Sir Herbert Leon Academy were able to offer Dons a slot on their 4G pitches in Bletchley. Blueprints to build a training ground in Milton Keynes have been scuppered at Kents Hill, the Bowl and at Tickford Fields, with the club never afforded planning permission for any of the sites. But while Winkelman’s endeavours to build inside borough boundaries have been rebuffed and rebuffed again, he has been forced to look further afield. That leaves Dons in the lurch for quite some time - two years at the very least according to the chairman - and having to beg, steal and borrow from schools in Milton Keynes borders on the shambolic. Without permission to build, or refurbish their current Woughton home, Dons are left effectively homeless when it comes to their day-to-day work. Robinson added: “For this club and everyone in Milton Keynes to enjoy this adventure, the training ground is pivotal. If they don’t get one soon, there might not be many more occasions like Sunday to enjoy in Milton Keynes, and that certainly would be a failure.